Terror Of The Cybernetic Space Monster??? Smoke me a kipper, I'll be back for breakfast.!!! Ace Rimmer? The return of the Red Dwarf? Sadly no. It's once again Sci-Fi Power Metal from Sacramento, California and it's ever so Pluto and Mars. Actually. It's probably Uranus. Noted: They have this big weird mascot - the mighty Saibot - the lamest metal attribute ever since Ronnie James Dio fought a lame dragon on stage. What ever happened to Kayla Dixon? The lead vocalist is no longer in the band as she's been replaced with Sozos Michael. Band leader Jason Ashcraft comments on the audition of Sozos: "He is the kind of singer I have always dreamed of working with. Not only are his vocal skills top-notch but he understands and knows what the music needs. Writing together for this album was a breeze and I hardly had to ask for any rewrites. Often he would send me ideas that was exactly what I was thinking. I am thrilled to work with someone like that and can't wait to see what we accomplish together." Sozos, definitely no schmuck and you can trust him to fight off all the little green aliens and purple space monsters with his powerful set of killer pipes. Nothing here to make me listen again though. However. It's probably the mega super cool album if you're nine years old and looking for something to scare the crap out of your younger sis or bro. If you are into so-so, Edguy meet Gloryhammer Sci-Fi laden powermetal then you'll probably give this 12 thumbs up. 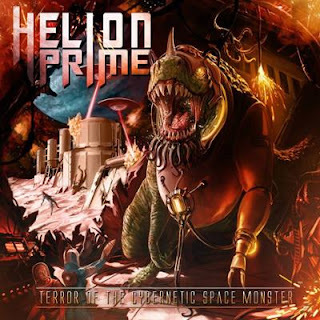 A Sci-Fi Metal band like Helion Prime, especially when armed with a song called "Spectrum", are always going to scale the weird end of the ehhh... metal spectrum. The seventeen minute monster title track marking a shocking finale that will leave you stunned and confused for days. The Sacramento band's new piece of work was mixed and mastered at LSD Studio by Lasse Lammert (known for his work with bands like Alestorm and GloryHammer). I'll type that again. LSD Studio. Plenty of space monsters. I rest my case and keyboards. Send in the Star Trek and Star Wars nerds.